Sports Officiating is Changing. And So Has Zooom. Sports Officiating is Changing. And So Is ZOOOM. It’s been a year FULL of changes. Not only in sports officiating, but also here at ZOOOM! 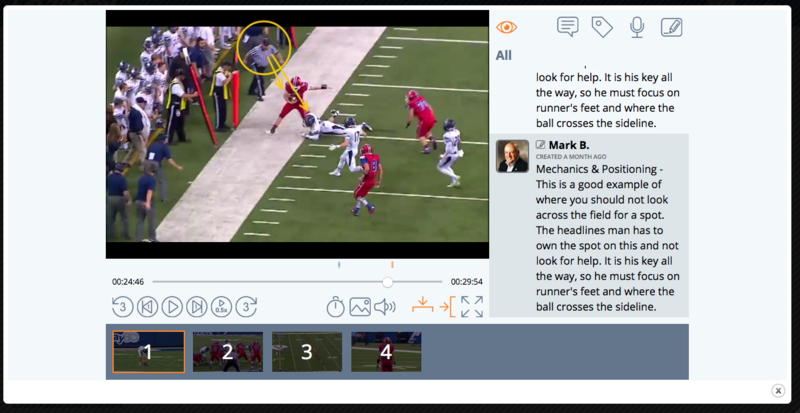 There’s never been an easier way to break down game video, specifically designed for the needs of sports officials. Analyze your game video and plays by adding voiceovers, slides or by drawing right on the screen. Build training and educational videos complete with “You Make the Call” questions to test your officials’ knowledge and understanding. Evaluate your officials’ on field performance, or build categorized libraries of plays, topics and points of emphasis in seconds. All the tools you need are included in ZOOOM and work on all your devices. So forget the fancy editing software and fire up your phone, tablet or computer and get to work anytime, anywhere! And what about sharing your work with others or getting feedback? How many times have you gotten stuck at, “this file is too large to attach” when working with video? Us too… So, we fixed it! ZOOOM will help you create an organized, completely customizable network of officials and groups within your account. Groups for your intramural department, state or local association, league or conference. Even your crew, or other officials you work with, can get involved. Then, you can share your videos with one click. Seriously… one click! Everyone in your group gets the same consistent training message, EVERY SINGLE TIME! by making recruiting, training, education, consistency and accountability easier than ever before. There is a lot more to talk about, so make sure to follow our Facebook and Twitter and ask us how YOU can help shape the FUTURE of officiating!